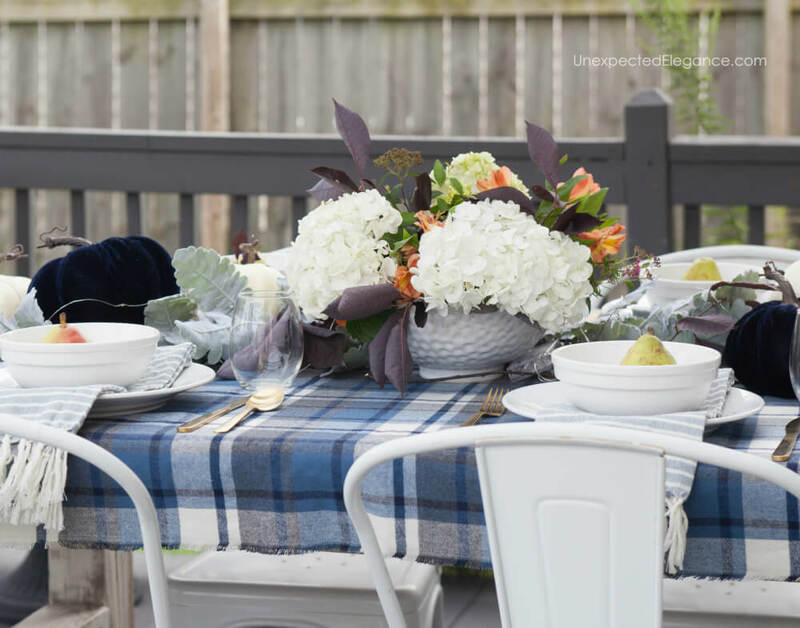 Check out my favorite fall outdoor dinner party tips to make entertaining your friends and family a little easier! I absolutely LOVE this time of year! The weather is beautiful and there’s a crispness in the air. 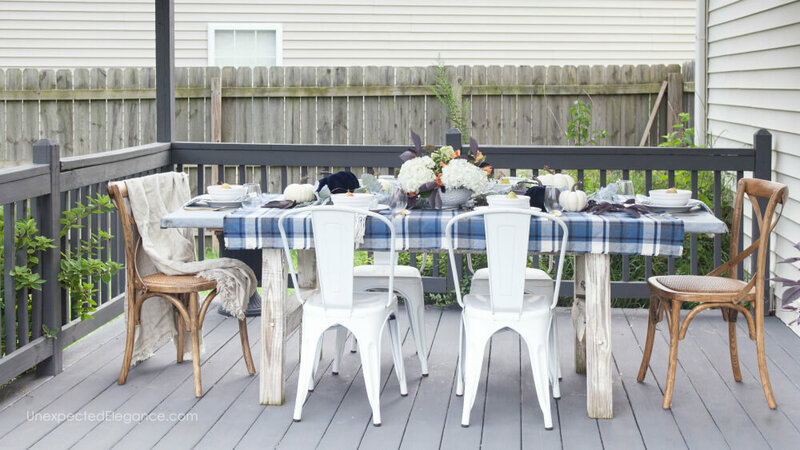 There are also fewer bugs, which makes being outside even nicer…so fall is a great time for outdoor entertaining. 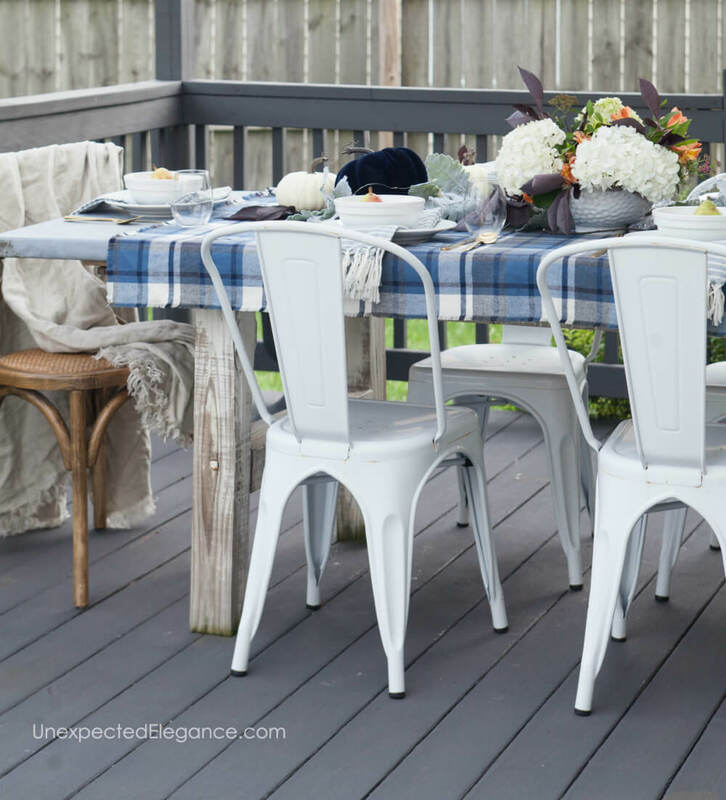 We spend so much time hanging out with friends on the back porch, having long dinners full of laughter and conversation. It’s one of my favorite things! Fall is all about cozy texture. 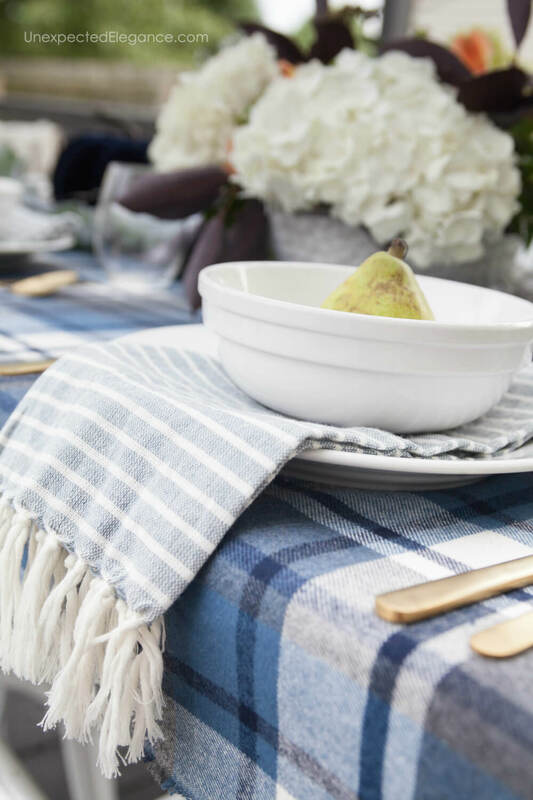 I love to use different fabrics to create layers on my table. Plaids are especially fun. 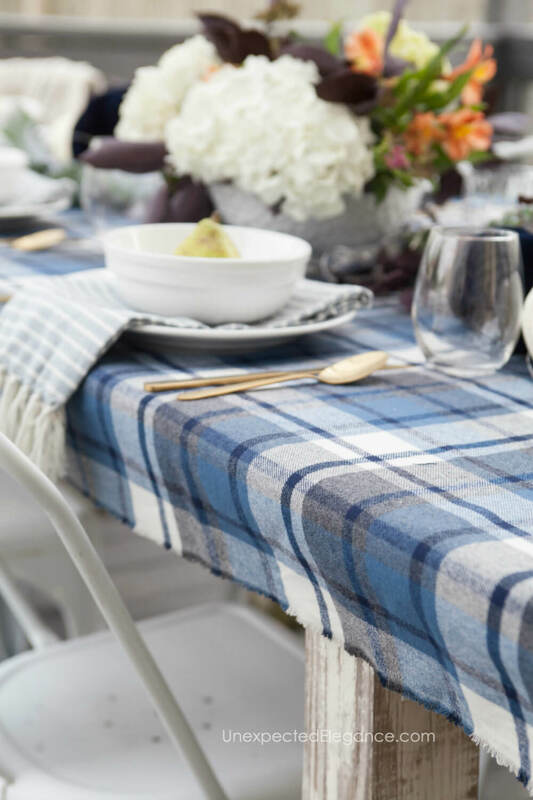 You can find a wide variety of different colored, flannel fabrics at JOANN and they make the perfect tablecloth. Then make sure the edges are straight. You might need to trim it. These make great throw blankets, too! The grocery store is a great place to find edible and seasonally appropriate decor. Just find a fruit or vegetable that’s in season. 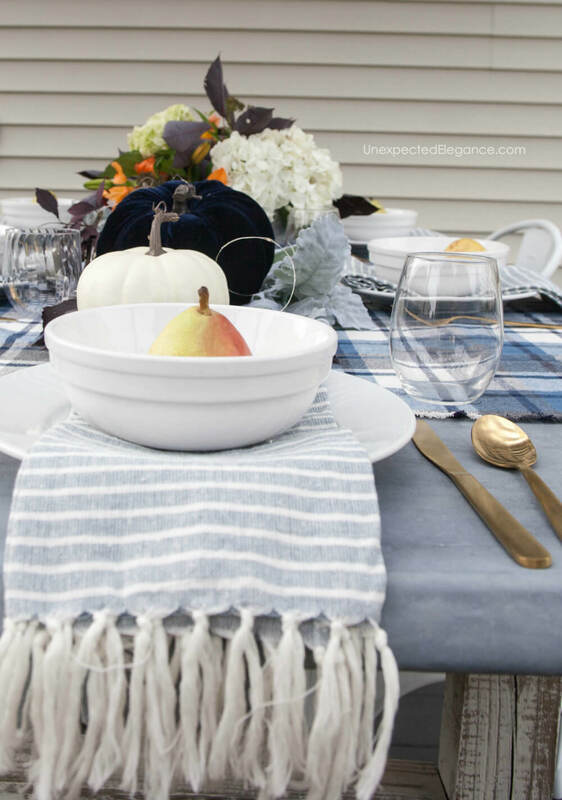 You can place pears or apples on your dinner plates for a cute and simple decoration. 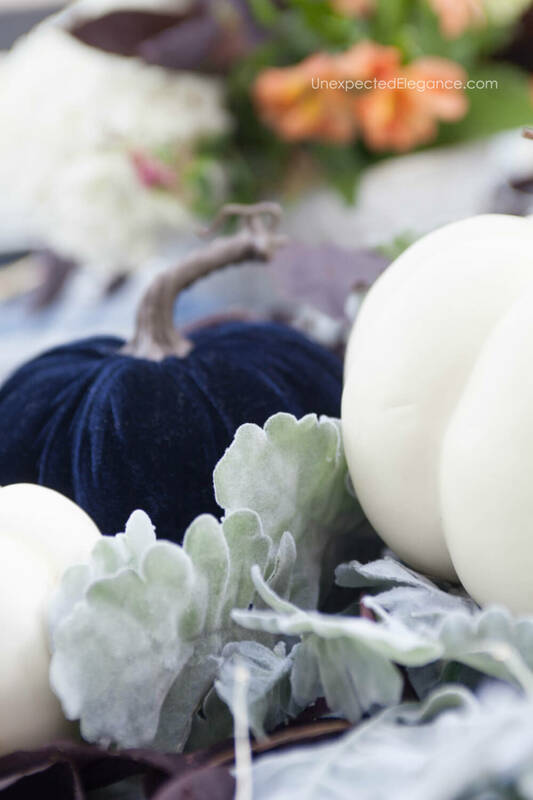 However, artificial pumpkins are great to add to your table for a more festive feel. You can use them every year and they are very versatile. 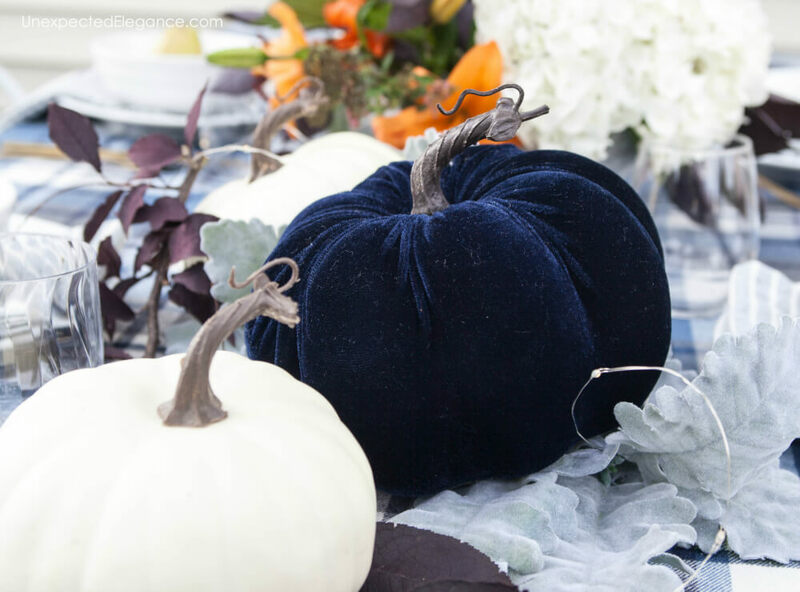 I love these simple white pumpkins mixed with the navy velvet ones to coordinate with my tablecloth. 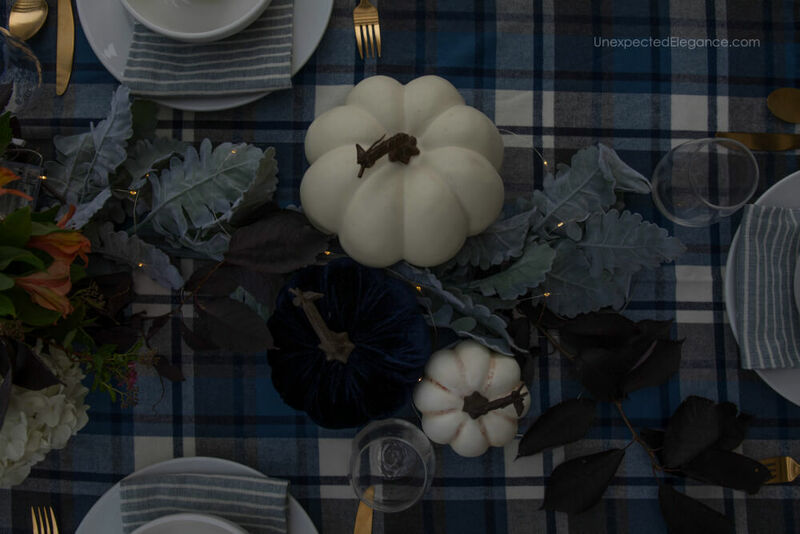 I like to have artificial branches and stems on-hand for decorating my table. Something like these dusty miller stems are a great option. The color is soft and will blend with almost any color scheme. To bring in some natural elements, just cut a few small branches from a tree to mix with the artificial pieces! Nothing beats the simplicity and elegance of white dinnerware. White plates go with everything. They also allow the rest of your décor to shine and they even make your food look better. Best of all, simple white dinnerware pieces are extremely affordable. Don’t forget to add some lighting. There are so many ways to add mood lighting. We have larger lights behind the table, so I love to add these fairy lights down the center of the table. It accentuates the decor and adds ambiance. Other great options for adding light is battery-powered candles or white Christmas lights hung above the table. 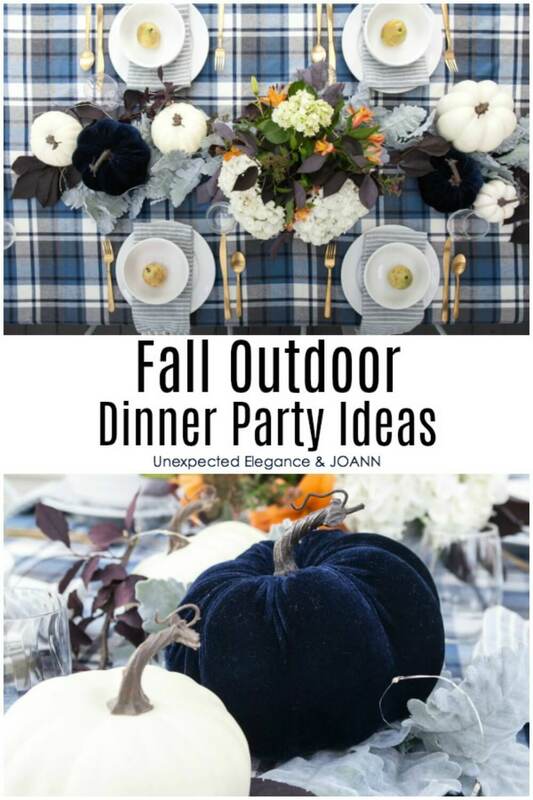 Outdoor dinner parties hosted during the fall months are the perfect chance to break out your decorating skills. 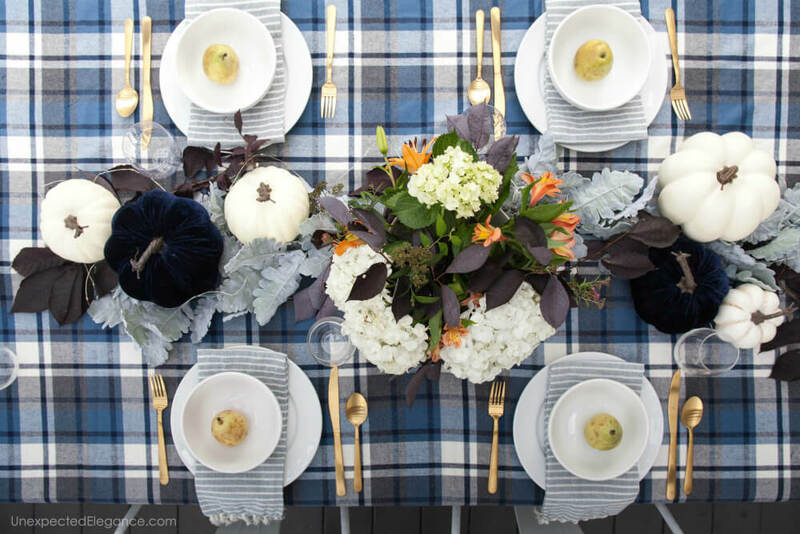 There are so many little things you can do to make your fall outdoor dinner parties elegant yet simple. Just think outside the box a little. 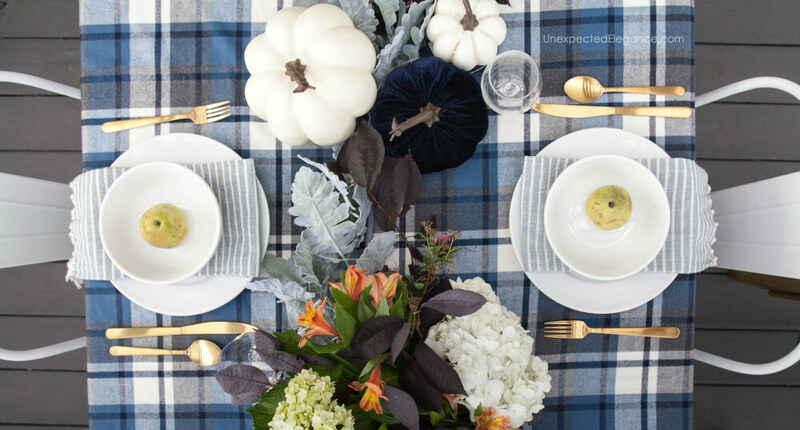 Check out more inexpensive ways to decorate for fall HERE.